We are manufacturing single and double sided rotary Tablet Punching Machine. Tableting Machines : Rotary type GMP 8 station Machine. Multi Punch Heavy Duty Machine. 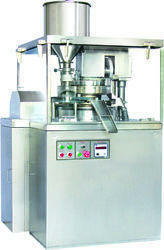 We are involved in offering assortment range of Tablet Punching Machine. These machines are well known for their quality, durability and are fabricated by using qualitative raw material by our vendors. Moreover, these machines are widely appreciated by our clients which are situated all round the nation and can be availed at market leading prices. We are offering tablet punching machine that is uniquely designed for easy maintenance and offered at industry leading prices. It is heavy duty machine fitted on a cast iron stand. The machine is driven by a suitable motor and is provided with S.S. hopper. The pressure etc. can be adjusted by means of lever provided. The machine is supplied without dies and punches. Speed 3000 strokes/hour. Single Side Rotary Tablet Press Machine is widely used for small and medium scale batch production. Machine design is as per GMP directives. Contact parts material is SS 316. Construction of main body structure material is Cast Iron. We are offering Tablet Punching Machine. We offer 10 STN rotary tablet punching machine. Our high quality tablet punching machines support tablet manufacturing on a daily basis. We manufacture rotary tablet punching machine with quality and cost in mind.